R850 per weekday night, R950 per weekend/public holiday/night before public holiday night. Minimum 2 night’s booking on weekends and 3 on long weekends. Reduced rate for single persons on weekdays. R850 per weekday night, R950 per weekend night. Then R200 per person per night for persons 3 and 4 weekday and R225 pppn for persons 3 and 4 weekend/public holiday/night before public holiday. William’s, Sam’s and Chimangi Moonrise R150 pppn, children 4–12 R75 pppn, under 4 free. Shady John’s R150 pppn, children 4–12 R75, children under 4 free. Regret maximum stay 14 days and no reduction for long stays. DSTV Access for the Cabin and Cottage provided. KINDLY NOTE: There are no credit card facilities available on site – a 50% deposit on booking secures the booking, the balance payable on or before arrival. Travel up the N1 from Makhado (formerly Louis Trichardt) to Musina. 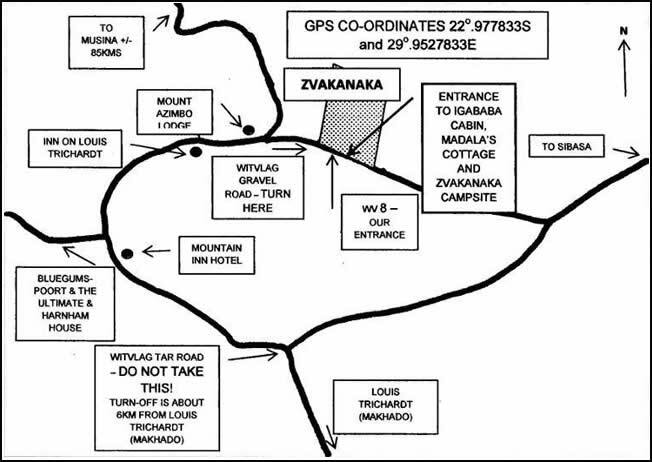 Approximately 11km from Makhado, 1km after the Avoca Vale Hotel, is a turn-off to your right to Witvlag. This is a gravel road. About 700m along this road, on the left-hand side, you will see a signposted metal gate with wooden edging – WV8. Pass this and then you will come to another gate on your left, this is the entrance for guests to the farm. On booking you will be given the combination to the padlock. GPS co-ordinates : 22°.977833 South and 29°.9527833 East.